Discussion in 'News' started by napash, Jan 28, 2018. Fake news, left and right. By now, we have a sense on how dangerous misinformation is. With the breaking headlines such as the suspected US Election and Brexit meddlings, some claim the fake news is being weaponized. I am very wary with online contents and do a lot of checking and verification before believing things, but I am amazed and troubled why a lot of people are being deceived. With technology being so fast-driven, their are challenges on how to deal with it. I believe prudent is required on each of us regarding this matter. What do you think? Why are people deceived by Fake News? Personally, I think fake news and misinformation is becoming a very common and easy to miss hazard on the internet. I think there are many different ways people can deliver and interpret fake news, from the blatantly obvious, to the believable and professional looking. I always check multiple other aources if I have doubts about what I am reading and avoid sites that I think look fake. I think people are decieved by fake news because many sites that look very real and have believable news on them are often fake. I only believe official sources and even then like to check with others. Fake news is really getting rampant. Especially on social media. People spread fake news to get attention. and fake the truth. We need to be wise and not take part in spreading fake news. Especially fake news which involve tainting a person's character be wise. How would you feel if someone told a lie on you and spread it through social media? Fake News? One more reason to be ignorant of the newspapers. But it is something worth discussing. That being said, I'd rather not loose my time with something like that. What surprises me most is that the "common wisdom" of today is that "fake news" is a new phenomenon. In fact, "fake news" has been a part of the American experience as long as news has been around. 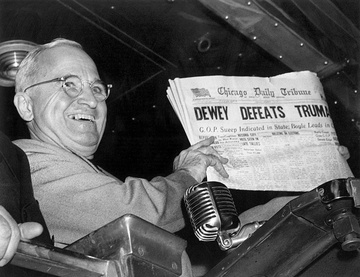 Does no one remember the famous Chicago Daily Tribune headline of November 3, 1948? As you can see, a major newspaper of the time misinformed more than 150,000 of its readers in regards to who had won the Presidential Election. Talk about your fake news! Sure, one can argue that in the "Dewey Defeats Truman" case this was more a result of time-pressured deadlines rather than any sort of intentional misinformation. So, let's move from 1948 up to 1969 and from Chicago to the San Francisco Bay Area. At 3 AM Saturday, KFRC announced that Woodstock was "Altamont East," and the public wants traffic jams, give 'em the biggest traffic jam ever, despite the fact that there were no traffic jams. You coud drive at sixty-five miles an hour from Altamont to Livermore and back, twenty miles in all, with KFRC, 610 on your car radio, informing you that traffic was backed up twenty miles in either direction and that access was completely closed off. Isn't that the very epitome of "fake news"? These were radio stations (the primary live news source of the era) giving out "news" that was obviously false to any one paying attention in real time. None of this is intended to make an excuse for those who create or spread "fake news". It's just meant as a reality check of sorts. Fake news is not new and, if history repeats, it's not going anywhere. It's up to the individual to check multiple sources if they want to find objective truth. This topic is very interesting and timely today. I often heard about fake news circulated in different social media platforms especially in Facebook which has the most number of users around the world. We all know that fake news is a form of spreading fake contents of a news that is commonly to mislead people. Fake news nowadays are hard to identify whether it is a verified article or not. For me, I don't usually get true information or news to main mainstream media if its credibility is already questionable. So I often read some articles to some bloggers which I thoroughly check whether the blogger is a reliable and a genuine writer. I also don't usually believe some news being circulated by share feature in facebook until I verified it from my reliable source. Honestly, I learned to fact-check a news first because of this fake news. Therefore, I think it is in our own research or fact checking to accept news from real to fake. I agree with this. In my country many believes in fake news in FaceBook and I think this could mislead others especially those with sheep mentality who blatantly follow what others do, which I think could hurt our society if fake news are not stopped. As for my self I always doubt anything I see on the internet. When I see a news, I have to check any other websites just to check if this is fake news or not. We can stop fake news on the internet by reporting it, as it will be removed when reported, and I believe we are the ones who can stop fake news, yes we may say that "we are just a single person" but what would happen if a billion says "we are just single person"? Fake news truly is a very serious problem all over the world. It can cause unlimited amount of damage of life and property if it is misused as a weapon. There have been instances in India where social platforms have been used to spread false news and create social disharmony amongst various sections of the society. It is not only the social media but also the mainstream media which is contributing to the phenomenon of fake news. Motivated and paid news to influence the opinion of the electorate is more and more prevalent these days. I think the media has to self regulate itself in this regard or else the judiciary or the Governments have to step in and regulate these individuals and organizations. Spreading fake news hampers our day to day life badly. Common people are the most sufferer of it. Every now and then, fake news regarding politics, products etc are telecast on social medias like Facebook, WhatsApp etc and common people get huntted of it . Our society should be seriously aware of it and take needful steps to ban it permanently.